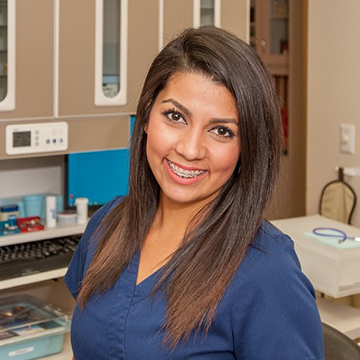 Claudia is a Dallas native that entered the dental field in 2011. She began her dental career in a practice that focused on pediatric dentistry before becoming the newest member of the Synergy Dental team. Although Claudia attended cosmetology school in 2008, she realized that she wanted to pursue a different career path shortly thereafter. “Working at Synergy Dental has given me the opportunity to work in a friendly environment where I’m constantly learning new things that will help me later in life. Seeing our patients’ reactions after the outcomes of their treatment is very rewarding and motivates me to continue being part of the Synergy Dental team.” When she is away from Synergy Dental, Claudia enjoys spending as much time as possible with her family. She stays active by working out and playing some soccer with her family.